from the UJM (Universal Japanese Motorcycle) transverse, in-line, four-cylinder designs of its competitors, and as such the watercooled, sixteen-valve, 90-degree V4 range has been the basis of the company's huge selection of street bike models built and sold in the 1980s. Initial problems with self-destructing engines cause by prematurely worn camshafts gave the V4 Hondas a bad name and nearly brought the giant company to the brink of financial disaster. class, the overbored 859 cc version of the recently introduced VF750 Sabre V4 engine swept up the World and British TT 1 titles, in spite of giving away up to 140 cc to the opposition, and then made the two crowns its own once the 750 cc class was introduced in 1984. 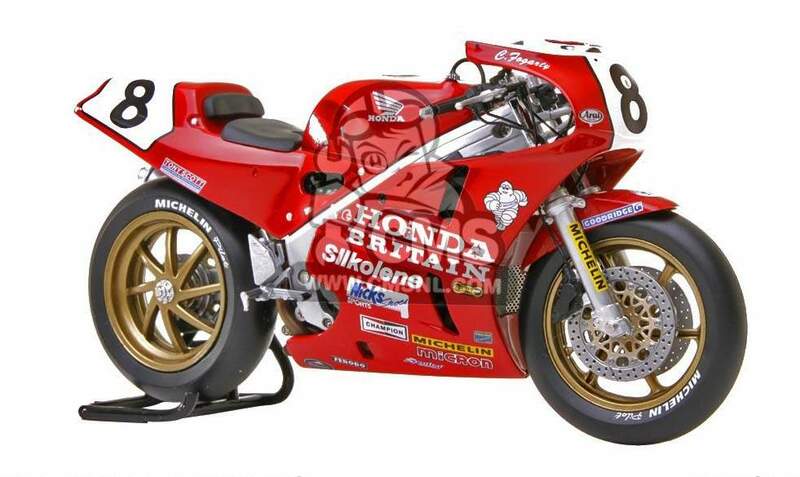 Irish ace Joey Dunlop won four world titles in a row on the Honda V4 (plus a fifth on the old in-line bike), before Bimota's fast and sweet-handling YB4 and Virginio Ferrari took the crown away from him in 1987 - mostly because Honda decided enough was enough, and gave Dunlop an ultra-modified street VFR to defend his title with, rather than the full-race RVF750. But for three years in a row Honda never lost a major FI race, thanks to the RVF's near-legendary reliability and speed. 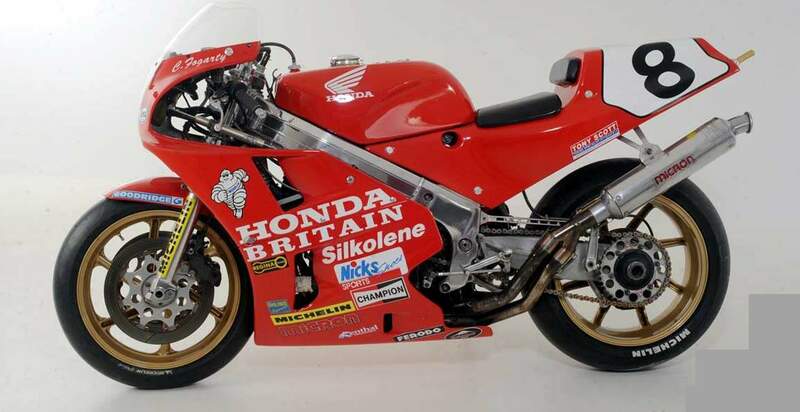 With a heritage like this, it's no wonder that when the Honda RC30 street bike was announced at the end of 1987, it was hailed as one of the great road bikes of the decade. Officially known as the VFR750R by Honda but nobody else, the RC30 (the company's internal designation, recalling the great RC-series GP bikes of the 1960s) wasn'tjusta road version of the RVF race bike - it was the race bike. It came complete with competition hardware like sophisticated 43 mm Showa forks, specially designed mag-alloy wheels, twin-curved aluminium water radiators, massive 310 mm front floating disc brakes with four-piston Nissin calipers and so on - much of it identical to the eguipment fitted to the NSR500 two-stroke V4 race bike on which Gardner hadjust regained the coveted World 500 cc title Apart from its race bike styling and fetching two-tone blue and white colour scheme, the RC30's most immediately distinctive feature was the ELF-inspired, single-sided swing-arm, dubbed the Pro-Arm by Honda. This had become standardized on the RVF race bikes in 1986, enabling ultra-fast tyre changes to be made while refuelling, since the wheel is released by unscrewing a single car-type nut, leaving the chain and rear brake in place. You have to be careful how you jack the bike up, though, as Yamaha discovered to its embarrassment when it copied the design on the Genesis.... Honda claimed that the extruded alloy, twin-spar Diamond frame was a direct copy, with the same geometry, as that of the RVF race bike, and with a dry weight of only 185 kg with lights and all other street equipment, this seemed likely: the Honda France endurance racer scaled under ten per cent less in full race trim. Yet if the chasssis specification of the RC30 was impressive, it was the engine technology that went into the bike that really dazzled. Effectively Honda had taken the RVF engine, silenced it slightly, detuned the engine a bit for use on the streets, and slotted it into the street bike frame. The 180 degree crankshaft throw of the VFR roadster was transformed into the 360-degree unit adopted by the race bikes to give better torque and traction, fitted with gear drive up the centre of the engine to the four overhead camshafts. Obviously the use of such exotic and expensive materials as titanium and ceramics was rejected on grounds of cost in a bike that would sell in the UK for around Â£8000. Apart from this the RC30 was mechanically a clone of the RVF, yet improved in certain key areas. dominated the Fl/Endurance classes for so long. components which increased power to an amazing 140 bhp -from a 750 four-stroke I No wonder the RC30 seems destined to go down in motorcycle history as an instant modern classic, one with power and pedigree.